2015 was a volatile year for the stock markets, and 2016 opened with a near obliteration of Chinese stocks on the first day back. Initially, we see gold profiting as a safe haven and as of 2017, gold could profit from the US dollar moving in a major top and starting a bear market. Gold is seen as a haven for cash. It doesn’t pay a coupon like a bond, and it doesn’t pay a dividend from a stock, but it does mean you own ounces in a physical precious metal that you can hold onto. A spike in the gold market usually means investors are worried about the state of more volatile asset classes like stocks or bonds. Technical analysts look at charts to pinpoint patterns in various markets and asset classes. From that, they forecast which direction prices are likely to move in. Riesner and Müller argued that equities had enjoyed a rise in prices for a while and that they were basically topping out. 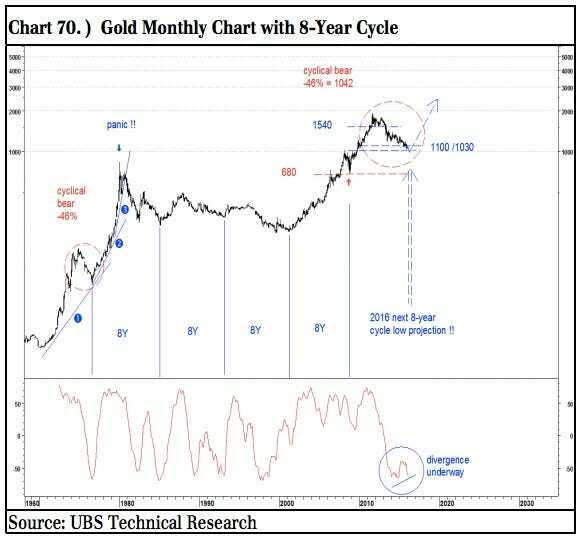 And this is where UBS sees gold going — up! Tactically, over the last three years, we’ve tried playing bear market rallies in gold and gold mines several times. In 2013 and 2014, our targets were reached. In 2015, the bounce in gold was weaker than expected. 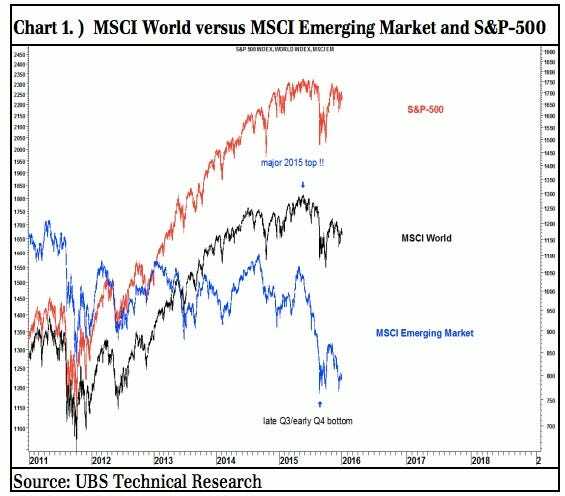 However, in all these cases we made it clear that we just expect a bear market rally before resuming its dominant cyclical bear trend. Generally, our cyclical roadmap and our long-term call on gold of the last few years has not changed. A potential bottom in 2016 bottom could be a rather powerful bottom, since together with a four-year cycle low we have also an eight-year cycle low projection for this year. In this context we expect a potential 2016 low in gold to be the basis of a new multi-year bull market. But it looks as if investors are already ploughing into gold. The price is now up by nearly another 1% at $1,085.90 an ounce as of 11:17 a.m. GMT. And when investors rush to buy gold, it’s usually a sure-fire sign they are worried about riskier asset classes.